If you need help with deployment, ask me before Tuesday. How weird is your household? In-class critique, pitting the New York Times data team vs a former Apple designer. 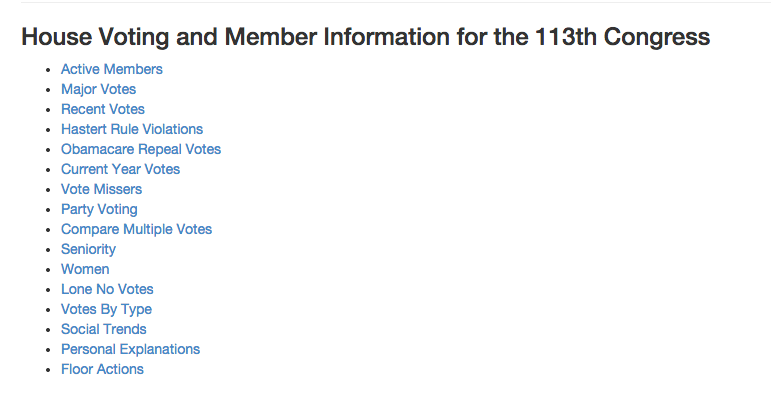 Here’s something you should be able to do with the APIs: Find the least partisan congressmembers by voting record. In class, consider how money spent is a proxy for competitive races. How much independent expenditure money was spent on Trump vs opposing Trump? How about Clinton? Which candidates had the most oppo money spent against them? How much money was spent on Facebook advertising in 2014 vs 2010? Then, apply the same process to candidate disbursement data. Pay particular attention to how different the fields are for independent expenditures. And before class (i.e. 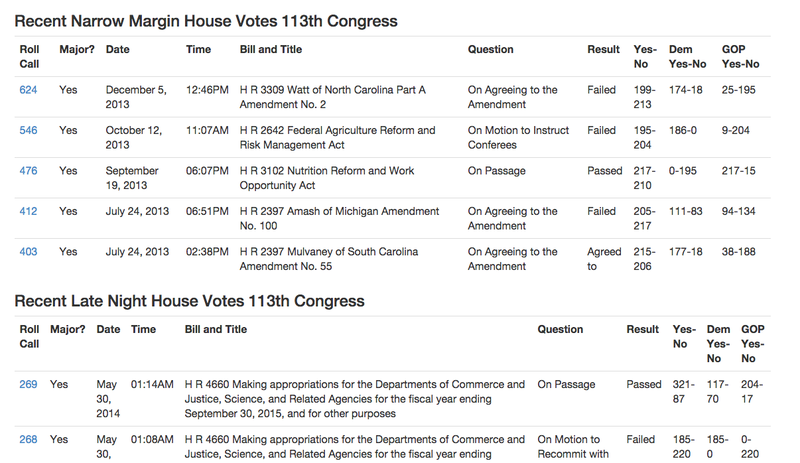 Tuesday night), email me with 10 interesting mashups of Congress data. Start out by creating a Heroku account, installing the Heroku toolbelt, and deploying the most basic of Heroku Flask applications. Then, try creating a Flask app that uses USGS earthquake data. You can start from this model repo. Get it deployed onto Heroku, and make it polished looking, like this polished version. Create a new Github repo (do not put it in cj-2016) named myfirstnewsapp that contains the code to your Flask app. Build a Flask app similar to the news app described in NICAR’s First News App tutorial. Deploy it to Heroku. Warning: the First News App tutorial contains a number of unnecessary steps that you don’t need to follow. It also does not contain any of the steps needed to get on to Heroku. You should be able to skip most of the installation instructions. Skip the instructions involving virtualenv and/or git – we don’t need the former, and you already know how to do the latter from the other tutorials. Skip Act 5: Hello Internet, because it describes an alternate way of deploying to the Internet. A homepage route/view that lists all of the data records and a “broad view” of those records. Here’s the homepage from the First News App example. A route/view for each record that shows more detail of the individual record. Here’s an detailed record view from the First News App example. FWIW, here’s my hot take on the First News App. The main change is that I use the Google Street View API to display a picture of the incident address. Don’t copy that code – it will be non-functional on a Heroku site, because Heroku uses https and browsers, such as Chrome, will not allow the importing of files from http (non-secure) URLs. Clone the repo here: https://github.com/datademofun/matplotlibsampler and work your way through the lessons. Homework (due May 4): "3-charts"
A scatterplot showing the relationship between two independent variables. Check out the data/schools or data/congress directory. Easiest example is: are high SAT reading scores related to high SAT math scores? (duh) You don’t have to join two different datasets. Your cj-2016/3-charts folder should contained saved images of the charts (i.e. .png files) and the code to generate those files. Tidy Data - This will seem like an overly dense file…but not reading it will make the next lesson on data-wrangling (which includes the concepts of pivoting and “melting”) data somewhat difficult for you. Death Penalty tracker...actually, you probably won't find this one much fun. The Guardian's The Counted also provides data. David Yanofsky of Quartz will talk about his entrepreneurial work in data visualization and investigations. Practice examining NYPD Stop and Frisk Data using interactive Python. To count what interests us. To communicate new insights to the public. Most likely via building web application. "To do what's right and to do it now"
Please let me know several days in advance if you cannot make class. There is a final project that will consist of a public-facing web application. Here's a nice example from a student last year. There will be 2 smaller projects, some of which will be worked on in-class and in groups. There will be readings/case studies every week. There will be challenges every week. We'll be using Python 3.5 and Github. You should be using a text editor for writing your programs: either Sublime Text 3 (3, not 2) or Atom will do. A text editor, such as Sublime Text 3 or Atom. We'll continue reviewing the Python programming fundamentals, in the service of deserializing text into data structures, and, when necessary, turning data structures into text files, particularly formatted as CSV and JSON. We'll also create our first static charts using matplotlib. And we'll create our very first news app, courtesy of NICAR's First News App tutorial. Our problem is not lack of information. It's lack of attention span. Data is not much good to us if we can't sort it the way we need it to be sorted. Hence, the need to scrape webpages and PDFs. We'll use ProPublica's Dollars for Docs as a case study. By now, we'll have written a fair amount of HTML. Web-scraping generally involves learning one more kind of text parser, such as lxml or BeautifulSoup, and writing the automated logic to navigate a website. Building a better Recalls site: studying the Recalls dataset. Homework: Build out the Recalls app as far as making it a table and adding product images. Studying both the technique and theory of effective data visualization, and how to use Python's matplotlib to efficiently produce charts. Using small multiples to get to "Aha!" Contrast/compare examples of real-world news applications and data portals, including ProPublica's Represent and Socrata. Learn how to deploy a basic app to Heroku (and maybe AWS). There’s one thing that has always bugged me about how we reference campaign finance data online: the best that most of us can do when we link to a campaign filing is to link to a particular page, whether that’s a list of contributors or a summary page. Yet often we’re referencing a single transaction or line-item. Maybe you don’t have time to read the Record every day; wouldn’t it be great if you could set some simple rules for things of interest and have a computer do it for you? Wouldn’t it make sense that a computer could find the exception to the rule among a series of House votes that occurred while you were out interviewing people? In-class time to work on and share projects.